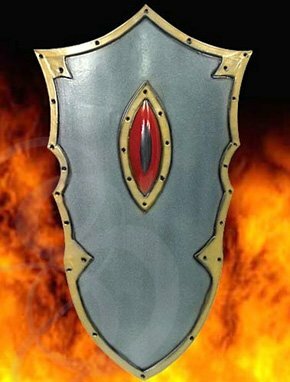 This amazing shield is centered with a demon eye, sure to strike fear into the hearts of your foes. The steel finish is edged with in antique riveted brass. The vertical straps and handle allow for maximum movement when blocking and fighting. Features a suede wrapped, hard rubber handle for superior control. The non crack finish assures service for many battles. Material: Latex and rubber with police-grade kevlar core.